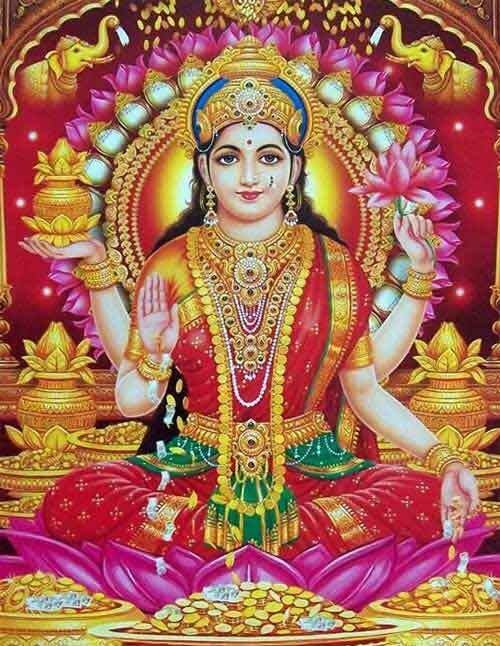 In Hinduism, Soundarya Lakshmi is a form of Goddess Lakshmi. In this form Lakshmi, is the Goddess of beauty. Puranas indicate that Soundarya Lakshmi had turned an average looking Rati, Brahma’s daughter, to the most beautiful woman in the three worlds. It is believed that Rati and her husband, Manmatha, god of love, worships Soundarya Lakshmi. It is said that the Solah Shringar, the sixteen beauty methods used by a Hindu bride, was first given to Rati by Soundarya Lakshmi. There are no major independent shrines dedicated to Goddess Soundarya Lakshmi. She is also rarely counted among the Ashta Lakshmis. She is worshipped for beauty, radiance and divinity. It must be noted here that physical beauty is worthless without internal beauty, intelligence and commonsense. Physical beauty becomes a curse when there is lack of understanding and knowledge. When worshipped with devotion and proper understanding, Soundarya Lakshmi provides a person with both internal and external beauty. External beauty fades out quickly but internal beauty keeps glowing. Even when external beauty fades, the internal beauty keeps a person attractive.